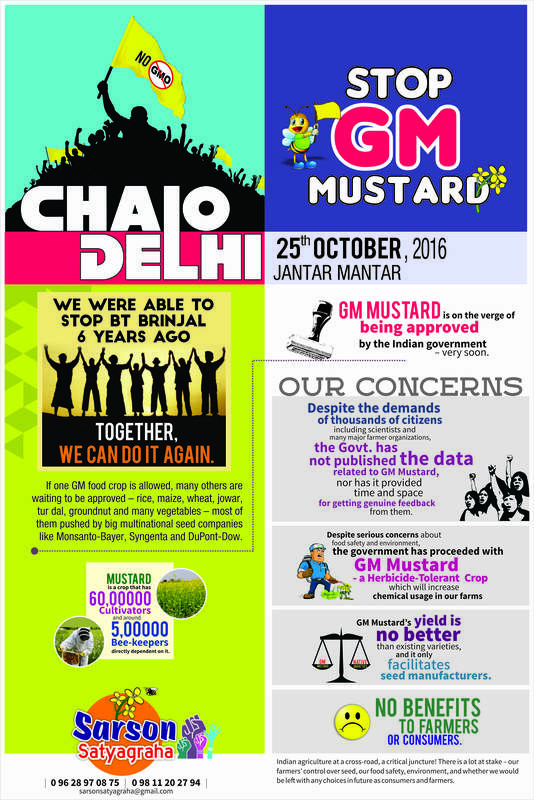 New Delhi, October 5, 2016: The Prime Minister’s Office (PMO) was today inundated with hundreds of faxes from all over India urging him to step in and stop any approval of the controversial Genetically Modified (GM) Mustard. The Genetic Engineering Appraisal Committee (GEAC) under the Central Environment Ministry is close to approving GM Mustard for cultivation in farmers’ fields, which if approved will be India’s first GM food crop. October 5, 2016 was the last day given arbitrarily for a 30 day public feedback time on a pre-concluded note clearing the safety of this GM Mustard which GEAC had put out on its website. In their fax to the PMO, the Coalition for a GM Free India stated that “Numerous letters, emails, faxes have been sent to the Ministry about the unscientific, rigged, hasty and opaque processes being adopted, making a farce of science and public participation. However, this did not evoke any meaningful response from the regulators whose job is to protect citizens from the risks of modern biotechnology. Without access to the biosafety data and adequate time for a well-analysed and considered feedback, we refuse to participate in a farcical process. We have already seen that their intent is malafide, after our sincere participation in a special meeting called by them where we raised numerous issues which were not considered in the safety assessment at all. Only glaring mistakes and miscalculations which exaggerated yield benefits seemed to have been corrected. GEAC is behaving arrogantly, assuming that it has all the expertise required to take up proper risk assessment, even though it does not, and is actually ridden with conflict of interest. It is also seen that studies have been designed as well as conducted by crop developers in convenient ways. This is what GEAC is hiding from the public”. The GM Mustard developed by the Centre for Genetic Manipulation in Crop Plants of the Delhi University called DMH 11 had been under fire from scientists, farmer unions, environmentalists, political parties and state governments on numerous grounds. On October 2nd this year, Gandhi Jayanti saw citizens coming out on the streets in more than hundred locations across 18 states of India, as part of the Sarson Satyagraha Campaign. Protests continue every day. This GM crop, with three bacterial genes, two of which are for pollination control and a third one for providing herbicide tolerance to the plant has been termed as unwanted, unneeded and unsafe by all. “It is alarming that farm livelihood security, food safety, citizens’ health and sustainability of our environment are not the priority of the government. It is also sad that scientific integrity is being buried in an unexplained push for a risky technology” said Kavitha Kuruganti, convenor of the Coalition for a GM Free India, “If there is respect for Science, Sustainability as well as Social Justice, the current application for GM Mustard which has bacterial genes for male sterility and herbicide tolerance, would have been rejected at the beginning itself. In fact, public funds would not have been wasted on this. Having spent public funds, to hold back data from the public despite repeated orders from CIC reveals the true intent of the government. The fact that GEAC refused to put in the public domain the entire biosafety studies and ran a sham of a public consultation process in a haste shows that they have something to hide on this unwanted unneeded and unsafe GM crop”, she said. It is noteworthy that the Sub-Committee set up by the GEAC and the AFES document they produced, which have been put up in the public domain, reveals that instead of prescribing various studies that should be done comprehensively, rigorously and for a long period in this appraisal stage, many studies are being suggested for a post-release monitoring stage, effectively making the entire country a big laboratory and all Indians as lab rats. Farmer Unions have been up in arms against this GM Mustard with all major unions across the country having already written to the GEAC and the Environment minister to stop the GM Mustard. “It has been now established that the claims on the yield increases are fraudulent and is only to lure our farming community into a trap of market controlled seeds and herbicide combination, the beneficiary of which will only be agri-business corporations”, they pointed out. The Farmer Unions have in the past also stated that it is the import tariffs for edible oil which are as low as zero in the country, which have destroyed the market for them, affecting production of indigenous edible oils and that no technology can solve that crisis. Recent days have also witnessed the honey industry and bee keepers join the opposition to GM Mustard as there are concerns about the impact of commercial cultivation of this GM crop and subsequent use of herbicides on the bee population and honey production. They had written to the central government as well as held a dharna in Delhi to draw attention to the potential adverse impact of the release of this GM crop on the 90000 MT honey production in India. Importantly, more than 5 lakh families are involved in honey collection and bee keeping in the country. Dr Debal Deb, an eminent ecologist and a member of the delegation who presented various concerns to the GEAC in a meeting organised in July expressed shock at the unscientific and hasty manner in which the regulator is pushing ahead with GM Mustard. “If science is respected and followed rigorously, including through processes of independent scientific review, would GM Mustard get approved? We believe that it would not, and this is the reason why the regulators are hiding the biosafety dossier from public scrutiny”, he said. Many state governments, including Rajasthan and Madhya Pradesh that are the top two mustard cultivating states, have in the past stated their opposition to the release of GM Mustard. Bihar and Delhi have already written to the Centre against GM Mustard and others like Punjab and West Bengal have announced that they will not allow GM mustard. Recently Kerala government had passed a cabinet resolution to oppose GM mustard approval and participated in the Kadugu Sathyagraham observed all over the state on October 2nd. With the GEAC turning a blind eye to the nation wide opposition to GM Mustard, citizens, scientists and civil society formations have decided to press the case with the Prime Minister. They have urged him to ensure that scientific integrity is not compromised in any way in the name of swadeshi public sector GMO and unfounded benefit claims. They also demanded that decision-making on this GM mustard (and any GM crop) be made scientific and participatory, the essential first steps for which are to make all the data public, seek independent scrutiny providing sufficient time, and hold public consultations with all concerned including farmer organizations, independent experts from all relevant domains, and citizen groups.